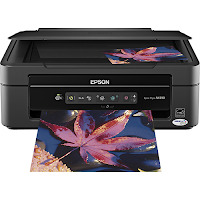 Today only Best Buy is offering a Epson Stylus Small-In-One Wireless Printer just $40 . That's 43% OFF the regular price and comes with FREE shipping in in-store pickup. This little guy will print, scan and copy whatever you see fit, and all through that wireless way that the kids are into. Stick it in your garage so it's out of site, and be in the west wing of your estate when you decide you want that document. I like that you can print glossy pics from your phone or tablet. Not that I would, but that I could.